The first thing that struck me onboard was the sheer variety of types of people; excited kids revelling in the freedom as their parents strolled behind them, couples of all ages holding hands in anticipation of a romantic break and groups of hedonistic twenty-somethings hitting the bar ready to take advantage of Amsterdam’s legendary reputation as the go-to city for non-stop partying. The ship itself was classed a cruise-ferry and it felt like a smaller, less formal cruise liner. There was a casino, 3 bars, shops filled with rows of designer clothing and accessories, as well as a plethora of restaurants all trying to tempt you in to sample their delights. And if you just want to just sit and take in the view and fresh air, there were plenty of seating areas outside on the deck. It pretty much had something for everyone. Sailing from Southshields in Newcastle, you can leave your car in a secure car park and take a short walk to the terminal where you check in. 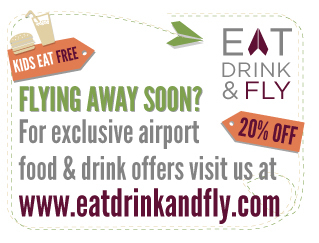 It’s a similar experience to your average UK airport but quicker and generally more pleasant. And once you’ve boarded, you can join the crowds as they wave goodbye to the North East coastline and watch its shoreline disappear. Our party consisted of 4 adults and 4 kids, ranging from 5 – 13, and we paid a bit extra for Commodore class cabins. It’s definitely worth upgrading as you get 2 full size single beds, 2 bunks and a fair amount of living space. All cabins are on-suite and come with the usual selection of refreshments you’d expect from a mid-range hotel. We soon discovered you also get a complimentary min-bar, and a fabulous buffet style breakfast enjoyed in a restaurant shared only with other Commodore class passengers. 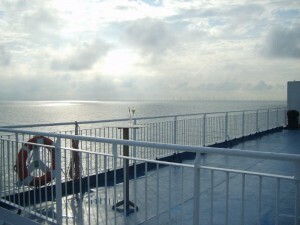 The sea crossing is done over night, and you get to Holland at about 9.30, after leaving the UK at 7.30 the previous evening. Once on Dutch soil, a coach takes you from the ship right into the heart of Amsterdam, leaving you free to explore the streets and canals that dissect the city. For first-time visitors, Amsterdam on foot is a fantastic way to see the city’s sights, listen to its sounds and soak up the atmosphere and culture; particularly as the city’s virtually car free as the locals prefer to get around by bike. And bikes are everywhere – piled up in massive bike parks and locked to every spare railing or lamppost and, if you can’t find your own bike, it’s normal practice to take someone else’s of the same standard! The excursion gives you around 5 hours in the city, so it’s a good idea to plan what you’d like to see before you get there. Try and visit the world’s largest flower market if you can, home to 15 of the most vibrantly coloured stalls you’ll ever see. It’s open all year round and sells an amazing variety of flowers and bulbs, as well as the requisite fridge magnets and bric-a-brac that many tourists go mad for. 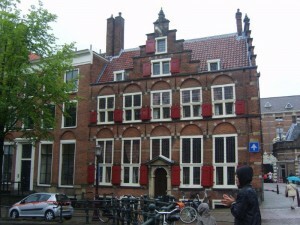 There are also beautiful old churches, magnificent buildings, inspiring art galleries and museums, and the banks of the canal are flanked by tall, thin houses that appear unique to Amsterdam. As with most other modern capital cities, the centre is very crowded but it’s really easy to escape the hustle and bustle and wander around the fascinating back streets. 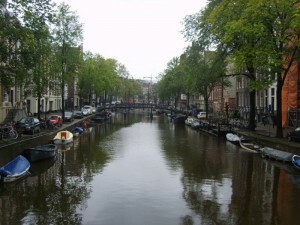 Or you can take a sightseeing tour via the canal if you want to spend some more time on the water. And if all that walking and boating gives you an appetite, there are loads of eateries to refuel and refresh yourself. With restaurants serving a huge choice of cuisines from all over the world and small cafes selling local specialities, you definitely won’t go hungry. And if chips are your thing, make sure you sample one of the huge cones of Belgian chips and mayonnaise on offer. Get there early though as the queues can stretch down the street. We took a midweek sailing so it wasn’t too busy. A mini-cruise really adds to the experience and made the trip feel more like a holiday rather than a city break. The boat’s crew were very helpful and laid on regular family friendly entertainment that caters for everyone on board. Food and drink can be a bit pricey so my advice is to take some supplies with you to save a few Euros. Other than that it’s a terrific way to see one of Europe’s most cosmopolitan cities. Amsterdam’s really easy to get to. You can sail from Newcastle as we did on DSDF Seaways for as little as £59pp if booked in advance. Check out their YouTube Advert. Travelling around Amsterdam’s best on foot, bicycle or canal boat. The city centre’s almost car free and tourists are encouraged to take the easily accessible public transport across the city. The city caters for food lovers. You can enjoy fine dining from all over the globe, as well as local delicacies like raw herring served on its own or with a selection of pickles. There’s also an abundance of small cafes, takeaways and large restaurants scattered around the city. Amsterdam is a haven for lovers of nightlife. With its liberal, open-minded outlook on life, tourists can dance the night away to live sets and concerts from respected DJs and bands. Rembrandtsplein and Leidseplein are where you’ll find the majority of venues. And of course the city’s coffee shops and red light districts are famous for the entertainment offered. For something cheap and different to do – try a picnic and a spot of people watching in the Vondelpark. It’s the largest green space in Amsterdam and is where the locals go to play football, cycling and walking, as well as that other famous Dutch pastime – smoking. It also houses a cinema and a fantastic Picasso Sculpture.